ArtStarts is inspired by those who feel moved to give back to their communities. We'd like to showcase the efforts of three students who, through their passions for the arts, organized a fundraiser so that other young people across BC could also access the arts. Nellie Sun, Lydia Sochan, and Ann Ping are Grade 9 students at Churchill Secondary in Vancouver. In their Applied Skills class through the two-year Synergy Program, their teacher Mr. Olson tasked students to create a "not for profit" organization with a mission and mandate, and plan an event to raise funds for a like-minded organization. The Applied Skills class allows students to learn different skills and build ideas that can be taken outside of the classroom and into the real world. Nellie, Lydia and Ann have a collective passion for the arts and they created an organization called LiveWritePaint. The students decided they would host an art show — Kaleidoscopes on Canvas — where paintings from local Vancouver artists would be displayed for sale. LiveWritePaint feels strongly that the arts are important for young people to thrive in this world, and after online research and a visit to the ArtStarts Gallery, they chose ArtStarts in Schools as their organization to support. 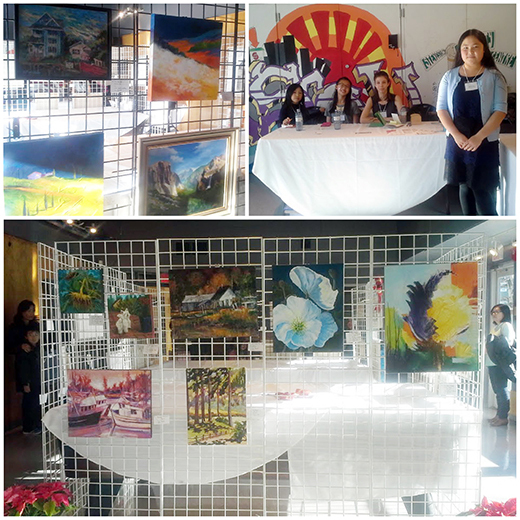 Their event took place in late November 2015 and 18 paintings were sold. Recently, Lydia and Nellie came down to the ArtStarts Gallery and delivered a cheque for a donation of over $1,500. We had a chance to sit down with them to ask a few questions. Why are the arts and creativity important to you and other young people? What was something you learned throughout the process of organizing Kaleidoscopes on Canvas? "There is a lot of planning and organizing involved. You really have to work hard for it. On the night before the event while we were setting up, we were really excited because it was actually happening!" How does it make you feel knowing that through your hard work, passions and efforts, you are enabling other young people across BC to participate in the arts? Is there a message you would like to share with other young people? Thanks to LiveWritePaint for supporting ArtStarts and, most of all, for inspiring us all to follow our passions! Learn more about how you can support ArtStarts' mission and vision.